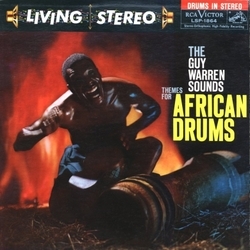 Just a brief word acknowledging the brilliant and beloved master percussionist Kofi Ghanaba (Guy Warren), who died last week at the age of 85. 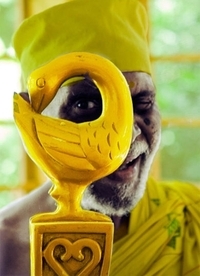 Born Kpakpo Akwei in Accra, Ghana, in May 1923, his family was fascinated by America and his name was changed to Warren Gamaliel Akwei (in homage, one imagines, to U.S. president Warren Gamaliel Harding, who died suddenly two months after Akwei was born.) At the age of 14, performing now under the name Guy Warren, he played drumset in the Accra Rhythmic Orchestra and then a few years later in the legendary highlife outfit the Tempos, both with future trumpet star E.T. Mensah. 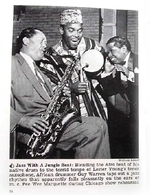 By the mid-'50s, Warren was living in the States and jamming with the likes of Lester Young, Thelonious Monk and other titans of modern music, becoming one of the earliest musicians from the continent to introduce African folkloric traditions to jazz. At first it was received mostly as a gimmick. 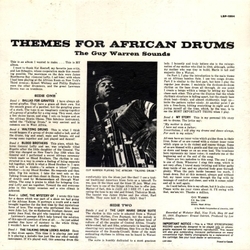 Max Roach, who would begin incorporating African rhythms and percussion into his music in the early 1960s once remarked that Warren "was so far ahead of what we were all doing, that none of us understood what he was saying — that in order for African-American music to be stronger, it must cross-fertilize with its African origins." But as roots consciousness began to have an appeal in Black American culture, the real value of Warren's contributions became increasingly celebrated. Hi Doug, thanks for the link to Soundological here and for this short 'n' sweet obit on this ground-breaking musician. Guy also recorded with Ginger Baker in the 70s, a version of "Blood Brothers" appeared on Ginger's "Stratovarious" LP. Growing up in Ghana at the time when Guy Warren(Ghanaba)had already explored the world with his music was a great feeling for up coming musicians.It has inspired us all till today putting Ghana on the world music map.His music will live on.May he rest in peace.